← Neck and Back Pain! This sounds very medical and complicated but in fact the principle is fairly simple, and it’s worth exploring because many people suffer from it to some extent or other. The symptoms are often either pain, or numbness/tingling in either one or both arms. Patients report that the pain often rises into the neck, occasionally causing headaches, and that symptoms tend to be worse first thing in the morning, easing a little as the day wears on. Does any of this sound familiar? The good news is that the cause is frequently, fairly straightforward, and may be due to tension in a group of muscles attached to the neck. 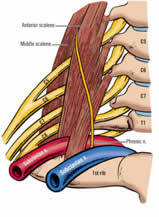 These muscles are called the Scalenes – there are three, an anterior (front) middle, and posterior (back) and they attach to the vertebrae in the neck at one end, and the first two ribs at the other. Unfortunately, nature has decided that the best path for the nerve roots to travel from the neck to the arm is between these muscles, and excessive tension pinches the nerve roots and causes some of the symptoms. To make matters more interesting, the subclavian artery (an important blood vessel carrying blood to the arm) also passes between the anterior and the middle scalenes, so the same tension can reduce circulation and add to the symptoms. This can usually be successfully treated with soft tissue techniques to relax the muscles concerned together with mobilisation of the neck, upper back and ribs to lengthen them, thus reducing the pressure. Stretching exercises can also be used in between treatments to improve the condition and speed recovery.